The yoghurt here is not as good as it was in Morocco. We're having breakfast at the hotel buffet, which costs 7.95 euro. It's an extensive buffet with eggs, sausages, bacon, lots of bread and bread rolls, croissants, pastries, cereal, yoghurt, cakes, Spanish omelette, cheese (Edam, Brie, and a fresh white cheese), cold meats, fresh fruit, juices, dried fruit, a bowl of sunflower seeds, and more. It has been a day of varied weather, with rain and hot sunshine. It began chilly and overcast as we departed the hotel after breakfast. 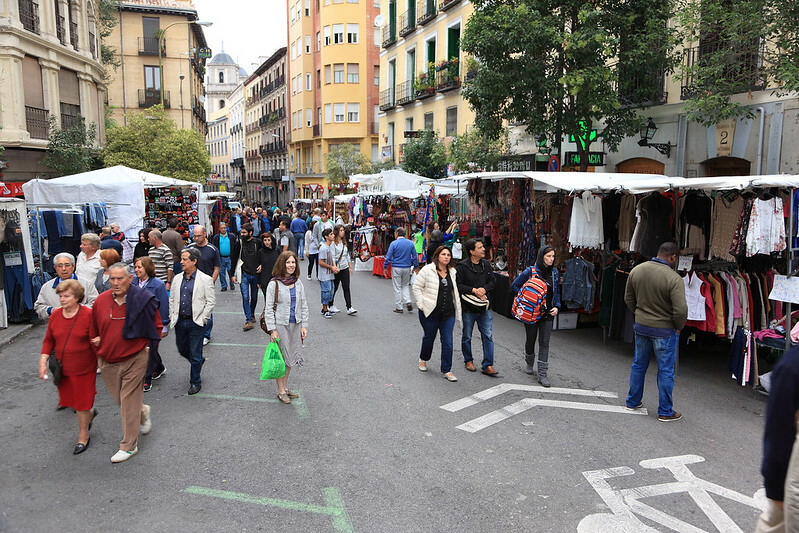 We wanted to head to the El Rastro market, a large flea market which operates every Sunday. Unfortunately my sense of direction is reversed in the northern hemisphere and we headed the wrong way to the end of the street until we checked a map and GPS. Since we had to pass the hotel again, we ducked in and picked up M.'s umbrella, as it looked like it might rain. This later turned out to be a good decision. We headed south to the market, through virtually deserted streets. Even though it was 10:00, there was nobody around. It felt kind of spooky, as if it was five a.m. and nobody was awake yet. 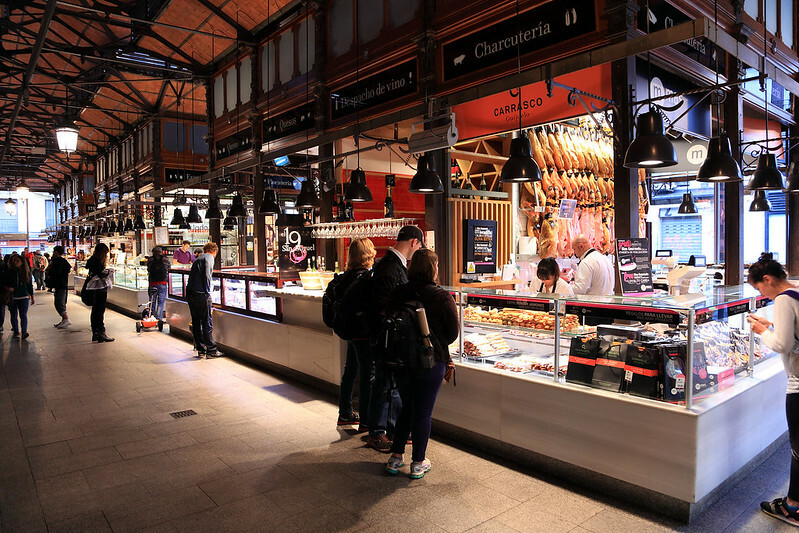 We ran into some people as we got close to the market, particularly when we found a food market, called Mercado de San Miguel. This was a collection of food shops enclosed in an old glass building, so you could see the selections of fresh fruit, vegetables, meats, cakes, and so on from outside. We went in to check it out. It was full of tourists - the only people up this early - gawking at all the food and taking photos. It all looked really good, but we'd just had breakfast. Inside Mercado de San Miguel. 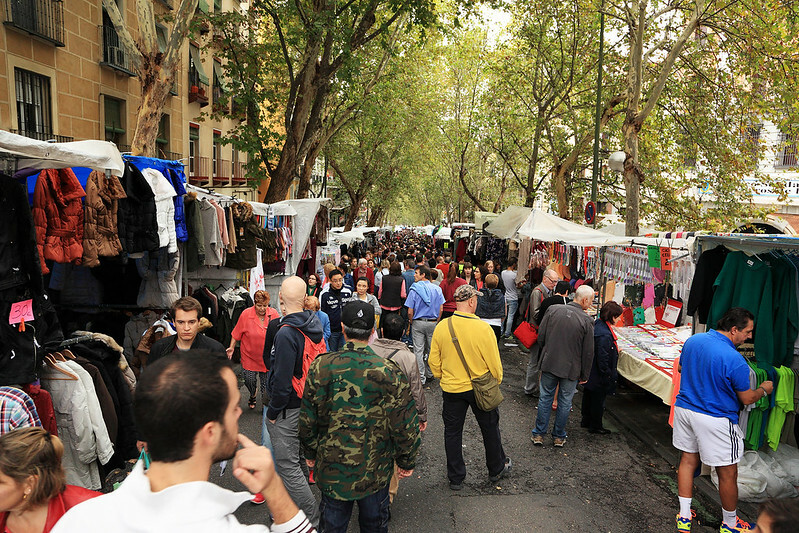 Continuing on, we hit the El Rastro flea market, which was bustling with people. M. quickly found a stall right near the beginning selling pants and skirts that she liked, and she bought one. Then we walked along the main street of the market, perusing all of the hundreds of stalls. The market spilled into some side streets as well, but the main strip stretched for several hundred metres down the one road. It was crowded and difficult to push through in places, but there was a visible police presence to deter any pickpockets. We browsed around but didn't buy anything else. 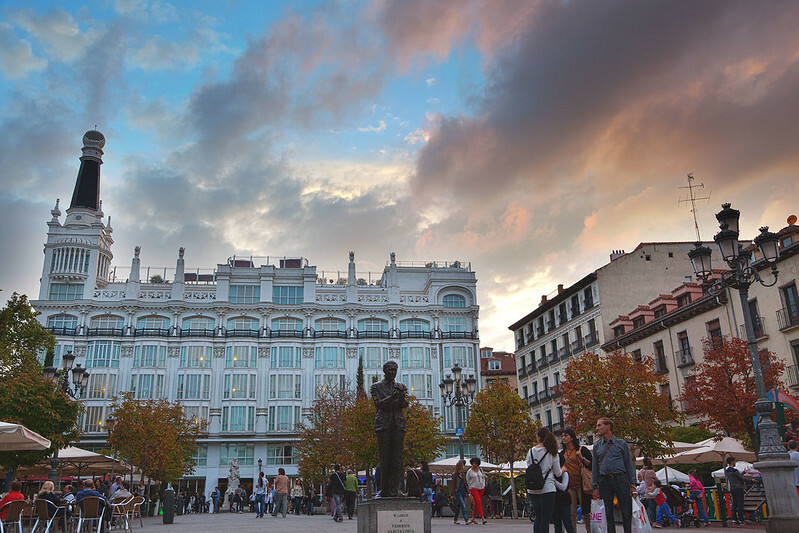 When we reached the end we turned around to head back to a side street we'd seen with many more stalls, which was in the direction we needed to head to the Prado Museum, out next destination. We walked around a block which had several art sellers and then along the side street we'd selected. At the end we checked our map and discovered we'd walked in the wrong direction again! So we reversed and now headed east towards the Prado. The streets between the market and the Prado were more residential and quiet. Things only became busier again when we reached the main road running north-south and flanking the museum. We decided to stop here and have a morning tea break before entering the museum. We found a cafe and sat down inside, near a window with a view of the street - Casa Luciano. M. got a cafe con leche, while I ordered churros con chocolate. The chocolate wasn't as thick as the one we got in Casablanca, but thicker than any in Sydney, and the churros were pinky finger thin, rather than the thumb thick ones I have seen before. They were okay, but not spectacular. While drinking, we spotted someone outside walking by with a Starbucks coffee. So when we left, we looked around and, sure enough, a few doors down the side street was a Starbucks. So we popped in and bought a Madrid mug for Hailey. As we came out again, it had started raining lightly. We walked across the road to the Prado and found we had to walk halfway around the building to the ticket offices and then a bit further to the entrance. The rain became heavier as we queued for a couple of minutes to buy tickets and we were lucky to make it inside to do something out of the rain as it began to set in. The Prado is not nearly as big as the Louvre, consisting of two main floors of exhibits, plus a small second floor, and a tiny basement level of just three rooms. We browsed the entire ground floor before having a break for lunch. The ground floor consisted of mostly pre-Renaissance paintings, mostly with religious themes. The highlight was Heironymous Bosch's The Garden of Earthly Delights, which was amazing to see in real life. After doing the ground floor, we went to the museum restaurant for lunch at about 14:30. It was a cafeteria style place, with a good selection of cold and hot dishes, including gazpacho, salads, hot soup, roasts, vegetables, cheese platters, and desserts. I chose roasted salmon with mixed vegetables, while M. had a Spanish potato omelette, and we shared a cheese platter, making it a substantial lunch. It was all reasonably good. After eating, we quickly did the basement level, which contained objets d'art, including a wonderful gold goblet which actually featured as a background object in a portrait painting we'd seen on the ground floor. Then we went up and looked through the second floor, before going down again to the substantial first floor. This featured many works by Goya and Velazquez, including Goya's horrifying picture of Saturn Devouring his Son, as well as Italian masters such as Titian and Tintoretto. Unfortunately there was no photography allowed inside the museum, so I couldn't get photos in there. 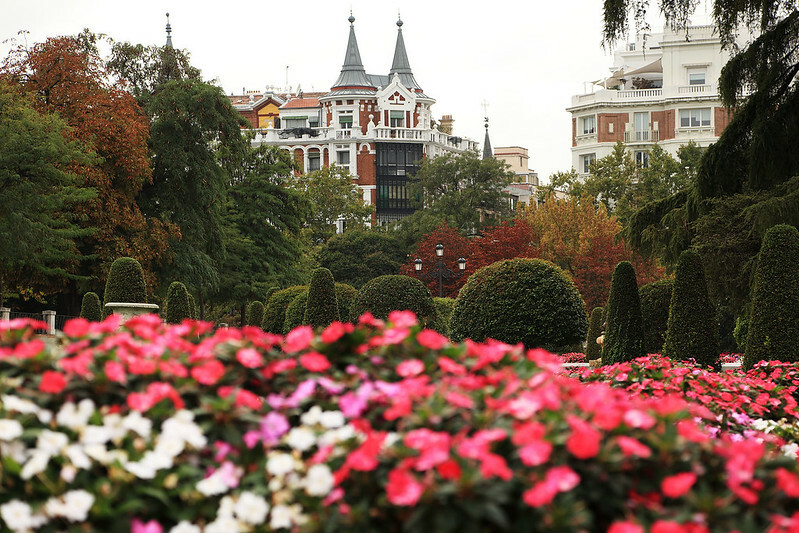 Jardin del Buen Retiro, near the Prado. After finishing the museum, we ventured outside, where it was still raining, but only lightly. 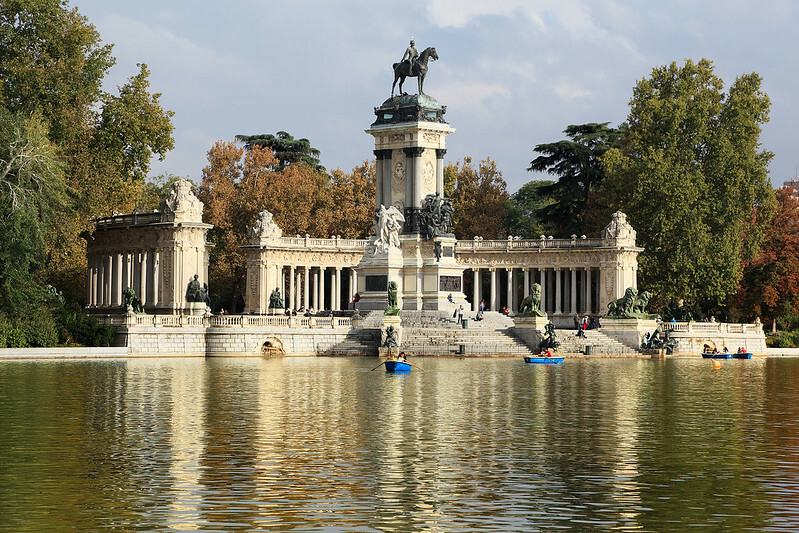 We walked across to the Jardin del Buen Retiro, which is an enormous park, featuring different sections with formal flower gardens and clipped topiary and hedges, forest-like areas, and a small rectangular lake surrounded by paths and an imposing marble monument to King Alfonso XII. The rain got little heavier and we sat under a tree for a while, sheltering under M.'s umbrella, until it lightened. The sky was very bright and the cloud broken up, and the rain didn't last too long before we could begin walking again. 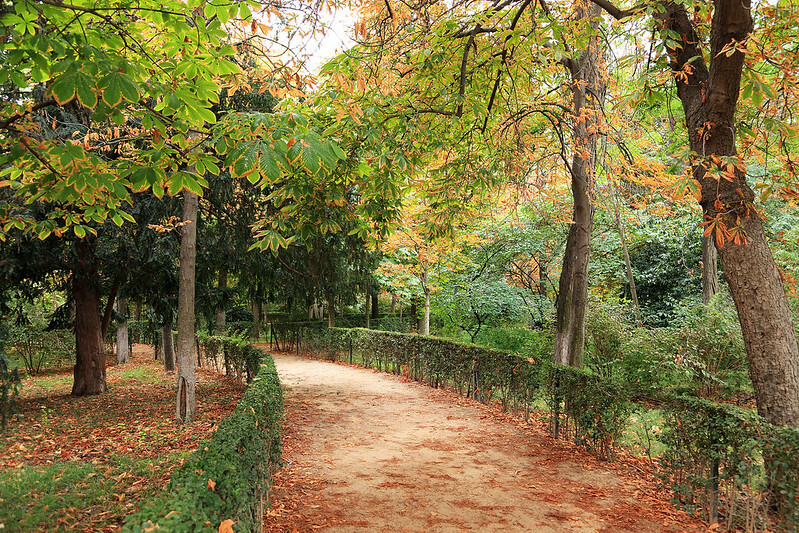 Forested area in Jardin del Buen Retiro. We walked along a path through a formal garden section, then up a slope to a sort of boulevard which led to a central fountain. From there we took a narrow path into the forest section, which contained many chestnut trees just beginning to turn orange with the autumn weather. They had large green spiky fruit, many of which had already dropped the ground and burst open to reveal the glossy brown chestnuts within. We decided to walk around the lake, and began an anticlockwise loop. 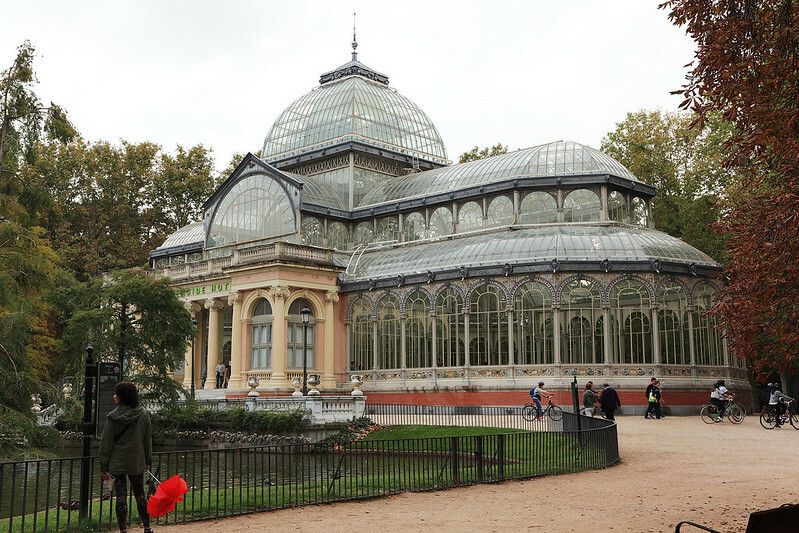 We ran across the Palacio de Cristal, a glass walled conservatory originally designed to house tropical plants, built in 1887. It had been temporarily converted into an art installation, with a fake sign outside declaring it to be the "Splendide Hotel". Inside it was bare except for a glass walled "room" with no doors in the middle of the bare concrete floor, which had carpet inside it and a pair of empty boots on the carpet. Wicker rocking chairs were placed around this room as part of the installation so people could sit and contemplate this mysterious remnant of the fictional hotel. It was kind of weird, but the conservatory itself was a beautiful old building. From there we walked north, reaching the lake and the monument on the eastern side. By now the rain had stopped completely and a hot sun was burning through the clouds. The park was also filling up with people, out and about now around 18:00, when earlier there had been very few people in the park. The first time we saw the lake there had been just one of the rowboats for hire out on it, but now there were dozens. Alfonso XII monument and the lake. 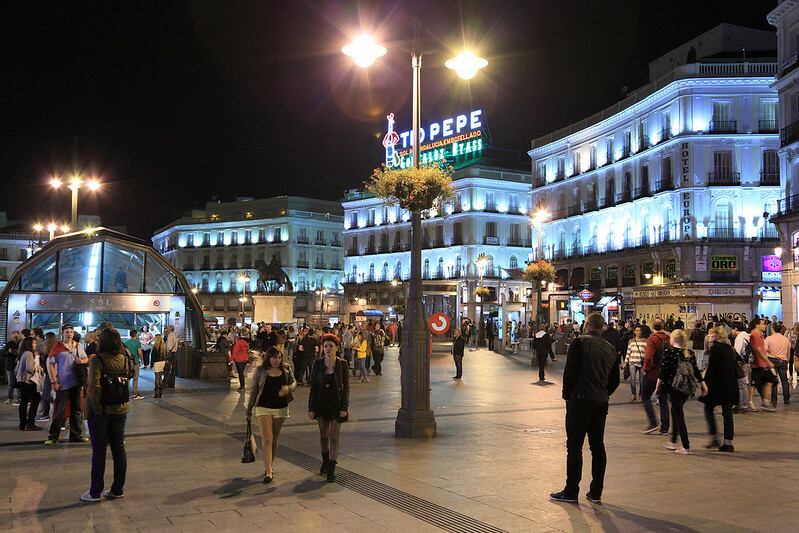 We walked out of the park and followed a street west until we hit Plaza de Santa Ana, in front of the Teatro Español, where we decided to stop for a snack. 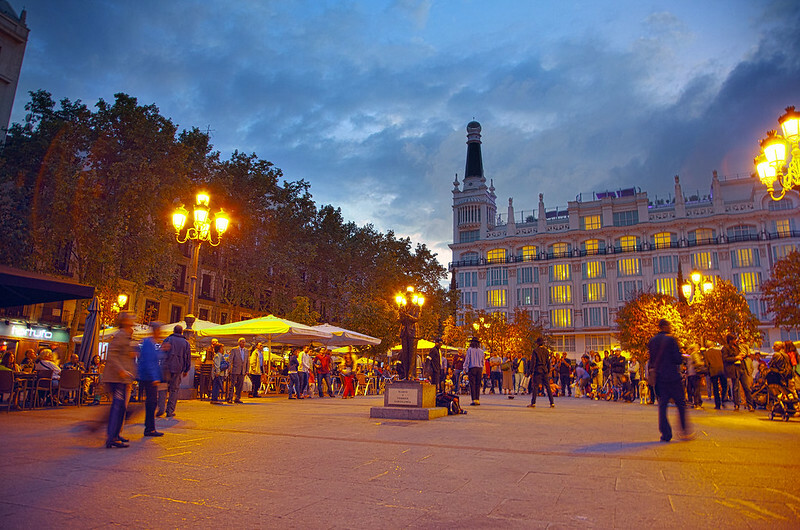 There were tables and chairs in the plaza under large umbrellas, belonging to several restaurants scattered around the periphery. We chose a table belonging to La Vinoteca. The service was very leisurely, but eventually we ordered some red wine and serves of patatas bravas and albondigas. These were larger than tapas-sized plates, and ended up making most of a dinner meal for us, as we added a plate of spinach croquettes to round things out. 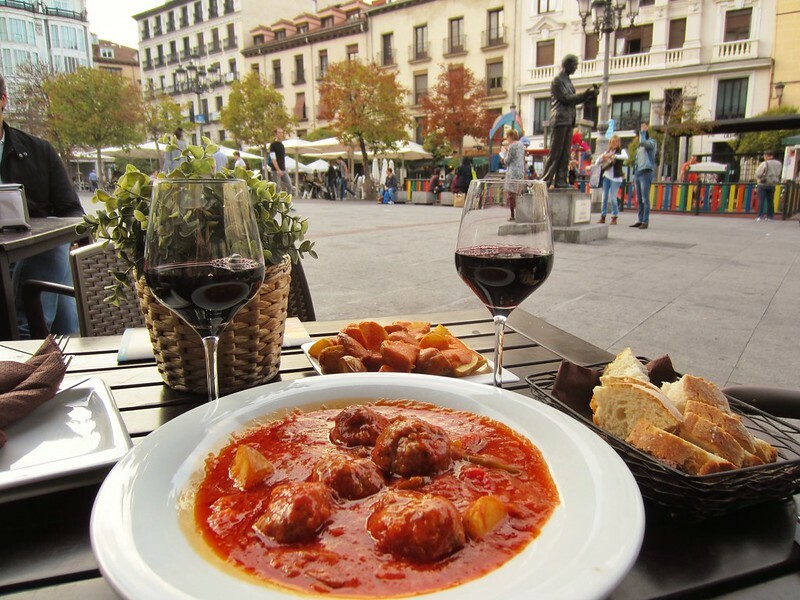 Albondigas and patatas bravas tapas plates. As we ate the sun went down and various street performers appeared. One guy played a few songs on a clarinet, then went around the tables selling CDs, before moving on to other tables around the square. In the centre, near a bronze statue of a man, a group consisting of four young men arrived, with one dressed like Michael Jackson. They did some dance routines to recorded Michael Jackson music, but tended to cut them short. Just as they were getting into Thriller and I started a video recording, they stopped! Michael went around the crowd with a hat, and then the group packed up and moved off. We spotted them again later on as we were walking home, on the pedestrian strip between Puerta del Sol and Plaza Isabel II. Obviously they do their routine a few times in different places throughout the evening. After finishing our meal, I ordered a chocolate "cake" with three textures and a glass of sherry, while M. got a cappuccino. The cake turned out to be more of a creamy mousse with white and dark chocolate and a thin layer of cake and some crunchy bits. It was pretty good, as was all the food. Having sat there for about two and a half hours, we paid and left to walk back to our hotel. The walk back was interesting, as we passed numerous restaurants now full of people, and lots of people strolling around the streets. It felt very odd for after 10 p.m. on a Sunday night! Back at the hotel, I grabbed my tripod to go out to the plaza near us for a few night photos. I just took a few, since the Plaza Isabel II is relatively quiet and empty compared to some of the other places we'd walked past, and I didn't want to walk too far again before retiring to bed for the night. We need to be up on time tomorrow so we can catch our train to Zaragoza. Last updated: Monday, 30 March, 2015; 01:45:55 PDT.